Why Play Video Poker? Like blackjack, video poker involves making decisions that affect the profitability or lack of profitability in your play. If you’re playing on an appropriate machine, and if you can play perfectly, you can get the house edge down to 0.46% or lower. Blackjack players who are really good might be able to beat those odds, but that ain’t easy, have you tried counting cards? That’s the only way to get a better payout percentage playing blackjack as opposed to online video poker for real money. Below we will constantly update with the best sites where to play video poker games. Casino Bonus Video Poker Play Now! $100 Yes Play at Guts! Different video poker games have different payback percentages, but even the worst games with the worst paytables usually have better payback percentages than slot machines. It’s more exciting to talk about the really great payback percentages that are available. Jacks or Better, with a 9/6 pay table, offers a payback percentage of 99.5%. Some Deuces Wild games offers payback percentages of just over 100.1%. 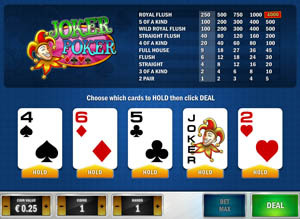 And one of the easiest video poker games to learn perfect strategy for, Pickem Poker, offers a 99.95% payout. Video poker is similar to slot machines and has something in common with poker besides just the name. The decisions you make affect how much you win or lose. That’s the biggest difference between a video poker machine and a slot machine, by the way, no matter what decision you make while playing a slot machine, it has no effect on the mathematical outcome of the game. 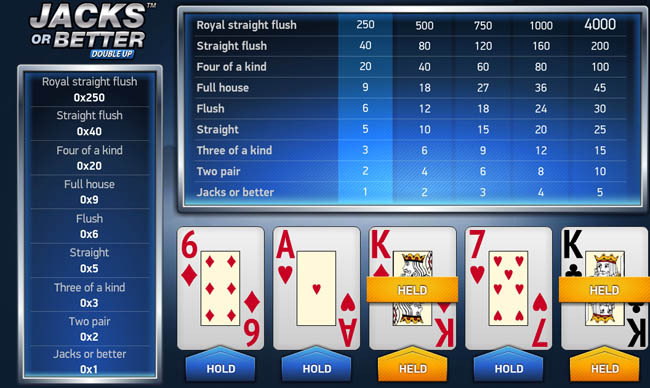 This site is a video poker guide that aims to teach you how to play video poker. There are two reasons we recommend playing video poker, one is that it’s a lot of fun! The other is that we think video poker is your best chance of winning against the casino in the long run. No other casino game gives you the chance to win with less effort than video poker.